Okay it’s not so much a “gig” as it is a massive gamble and even larger expenditure of time and energy. I’ve recently accepted a position on Shopetti’s advisory board. Shopetti is a site (and an add on at the chrome store) which enables you to shop at a bunch of different stores and then pay for it in all one cart. I love this. I shop for four people, a cat and dog. Being able to dump crap…. I mean treasures into one cart and then to pay once is incredibly helpful particularly around holidays and back to school. You know how you’re like “I’m only going over by $12 on her..” and then all of a sudden you’re $100 over budget because it was a bunch of little things that you bought at different stores and are redundant? Yeah, that. 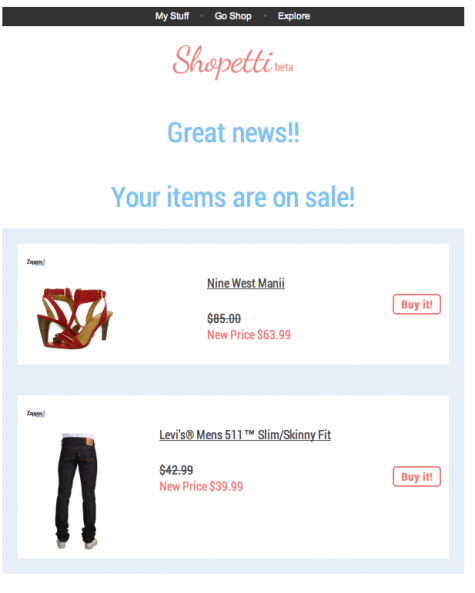 One of the newest features (and everything is new because Shopetti is a very young company) is that when you leave things in your shopping basket and they go on sale you’ll get an email. Like this one. There’s a quick and easy sign up with Shopetti, you can link it to Facebook or G+ in one click. The site is fun, if pinterest appeals to you, you’ll love Shopetti. You should also know that it’s in an early beta and because of that new features will be rolling out pretty regularly. If you want to give Shopetti a try I’ve got an added incentive for you. Money. Here’s a giveaway of $125 shopping spree. Someone is going to get a $125 AMEX gift card (they should totally use it on shopetti). Enter the contest, refer a friend…. show me some love because I’m putting heart and soul into this new venture and I want to bring y’all there with me. Very interesting concept – I think I’m going to like this…. Zappos and Target – go to shops for me. Definitely Zappos, Coldwater Creek, & Ann Taylor. I would shop at Nordstrom because they don’t have one here in NYC. This week, Banana Republic, Children’s Place and Pottery Barn! I woukd shop at Target, Children’s Place and Nordstrom via Shoppetti. Unless I was buying shoes or a clthing item for myself. Those have to be tried on first. Ann Taylor, Banana Republic, Nordstrom and Target! I shop at Gap, Old Navy, and Amazon a ton – I’d definitely like to try out Shopetti come Christmas!